In October 2016, she heard faint noises coming from outside her house. Kneeling in her yard near the source of the sound, she was astonished to see a tiny black cat looking back at her from a crawlspace vent. “I was so surprised I fell backward,” she said. She and her husband, Pat, contacted a local shelter but learned it was too full to accept the new arrival. Although they’d always been a “dog family,” Jennifer felt compelled to keep the cat, which they dubbed Russell. 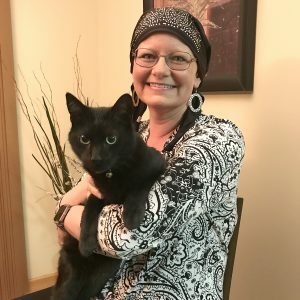 Russell was at her side to provide affection and companionship when Jennifer was diagnosed with breast cancer in the spring of 2017. She has a family history of breast cancer and had always made annual mammograms a priority. But that spring, a busy schedule led her to delay scheduling an appointment. “I knew better than to put it off, but I did,” she said. When Jennifer had her mammogram a few months later, the radiologist detected an abnormality in her left breast. Following biopsy, she received a diagnosis of Stage 3 breast cancer. In Stage 3, cancer cells have spread beyond the tumor to nearby lymph nodes. Although she’d always known a diagnosis was a possibility, Jennifer was still shocked. She hadn’t experienced any symptoms, and at 46, she was younger than her mother and grandmother had been at the time they were diagnosed. Experts recommend women begin having annual mammograms at the age of 40. One out of every 8 women will be diagnosed with breast cancer in her lifetime, and early detection can lead to less invasive treatment and a higher likelihood of survival. “The sooner you come in, the earlier that diagnosis, the bigger the survival rate,” said Jacquelyn Thomas, RT(CT) (M), Breast Imaging Coordinator at Memorial Breast Diagnostic Services. She added that it’s important for women to have a baseline mammogram on file. Then, if there is a change in their breast tissue, radiologists can compare the images. Thomas said doctors may advise women with a family history of breast cancer, like Jennifer, to begin scheduling annual mammograms earlier than 40. But since more than 80 percent of new breast cancer diagnoses are in women with no prior family history, those exams are crucial for everyone. “This is the most important tool we have in detecting breast cancer,” she said. Within days of her diagnosis, Jennifer consulted with a surgeon. “For the first two to three weeks after your diagnosis, it’s a whirlwind of doctors’ appointments,” she said. During a five-hour surgery, she underwent a mastectomy as well as the removal of 18 lymph nodes, 14 of which were discovered to be cancerous. Six weeks later, she began five months of chemotherapy. Today, Jennifer is wrapping up a course of radiation therapy that will conclude her treatment. She said the support of her friends, family and “cancer kitty” have helped her through a difficult time. She advises women who have received a breast cancer diagnosis to reach out to others who are going through the same experience by attending support groups. She opted to wear hats and scarves after losing her hair to chemotherapy. Sometimes, when out in public, she is approached by other cancer survivors who recognize this fashion statement. She’s encouraged by their stories—providing living proof that it’s possible to thrive after a breast cancer diagnosis.